Did Machinarium captivate you? Try these other puzzle adventure games like Machinarium that offer a similar style and vibe to the enjoyable and popular puzzle adventure. 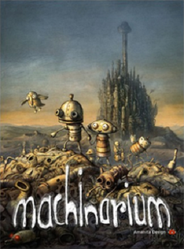 Launching in 2009 Machinarium returned the point and click genre to the front lines with a game that captivated many gamers and had them searching for games with similar features. Machinarium was no one hit wonder either, the same developer has published a number of similar games (some of which are featured here). If you're looking for other puzzle adventures that will test your brain or use point and click style mechanics you'll find some of my favourites here. If you don't agree with my selections then don't forget to leave a comment at the end of the page with your own game suggestions I'd love to hear about other games in this genre that you consider to be great. The Samorost series comes from the same brain that brought you Machinarium. With currently two games under it's belt (and a third in development as we speak) it's a great option for Machinarium fans looking to get a similar experience. Mechanics wise the series is very similar to Machinarium although slightly more shorter and simplistic than what it offered it is still a great experience. The original is available for free through the official website but the full version of the second game will set you back the low price of a few dollars. With simple point and click mechanics you'll explore a unique game world as a gnome known as Dvorsky. All of the aesthetics are very reminiscent of Machinarium with teasers and puzzles to solve without the help of dialogue. It's a style that fans will be familiar with and thus it's perfect if you want something similar. Puzzles don't involve an inventory of any sort and are instead focused on replicating a series of events in the correct order. I understand that it isn't a puzzle style that everyone enjoys but it's worth trying out (especially the fist game which is completely free). The game is set on the planet of Tiny Planet where life was a simple affair until a disastrous event (a meteor striking the planet). Just like any other standard video game adventure you're the only one capable of restoring the order and peace that Tiny Planet once enjoyed. Moving around the game makes the game particular enjoyable as you quickly zip across the various locations and solving puzzles. It's an adventure that is split into five different chapters each with its own theme that is different enough from the last that it remains enjoyable the whole way through. Combined with the 30 something puzzles and a dozen or so musical pieces it's a very peaceful point and click puzzle adventure like Machinarium. Botanicula is another one of the great games to come from Amanita Design and is one of the recent games to come from the developer being released in 2012. In the game you've got a very similar universe to what Machinarium offers with something relaxing that encourages you to explore a world without text and dialogue. The game has a ridiculously huge number of locations (over 150) making it one of the largest games in the genre. In true Amanita Design each of these locations is extremely unique so it feels like you are exploring an entire world. It's also got the level of musical masterpiece that you'd expect to see which gives you a great relaxing atmosphere to enjoy. For the great hunters out there you'll also have plenty of hidden items for you to find if you're so inclined to hunt them down. This does give you some extra hours from the game for those that can't put a game aside until they 100% it. Some of these hidden items also get you extra endings if you're diligent through the game. With five characters also available that have their distinct personality I consider this game to be just as good as Machinarium (if not better) and it shows that Amanita Design still has some great games incoming. Know Some Other Great Puzzle Adventure Games Like Machinarium?